Robert Burns spent his first seven years at Alloway, before moving to Mount Oliphant farm in 1766. In 1777, when he was 18, the family moved to Lochlea (or Lochlie) farm. During these formative years Burns had to turn his hand to farm work, doing a man's work while still a boy. Overwork after rheumatic fever started the heart disease that eventually killed him. But, following the established Scottish tradition, Robert's education was not neglected. 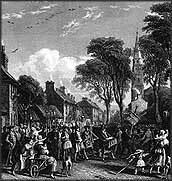 He attended a local school set up by his father and four neighbours, with the 18-year-old John Murdoch as teacher, and also received additional instruction in Latin, French and mathematics. These years saw his social life developing, and it was also during this time — when he was about 15 — that, according to his own account, he first turned his hand to poetry. Burns became a freemason of St David's Lodge, Tarbolton, in 1781. His lifelong connection with freemasonry provided a constant social support for him. 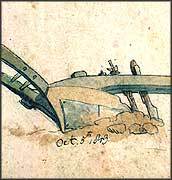 Plough sketch by Thomas Stothard. 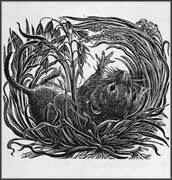 'To a mouse' by Joan Hassall. By permission of the Hassall Estate. 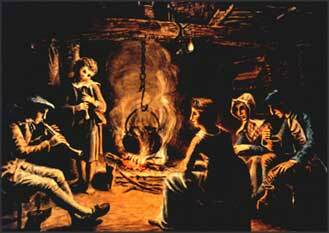 'Evening in a Scots cottage'. By permission of the National Galleries of Scotland. This kind of life, the chearless gloom of a hermit with the unceasing moil of a galley-slave, brought me to my sixteenth year; a little before which period I first committed the sin of RHYME. — Autobiographical letter to Dr John Moore, London, 2 August 1787: part of the Cowie Collection.